Before having a capsule wardrobe, I was a stay-at-home mom wearing sweats more often than real clothes. My closet was so packed with hand-me-downs, gifts, and stuff from impulse shopping runs that it was a mess. I was a mess. Feeling bad about how you look can affect the way you perceive yourself. It can send a message of self-doubt or self-care. At the time, I never felt put-together. I didn't know what to wear and trying to find something that went together from my packed closet was overwhelming. It would take me an hour to find an outfit and there'd be a huge pile on the bed. Even if I managed to scrape something together, it often didn't feel authentically me. When I happened upon an article about a capsule wardrobe, it jumped off the page to me. A simple solution to my crazy morning and an easy way to mange my closet? Yes, please! I decided to try it. I started getting rid of anything that did not fit, that was worn, that was torn/stained, and that I didn't love. That removed a large portion from my closet right away. I wanted my clothes to feel authentically me but I wasn't even completely sure what that looked like. So I started paying attention to the clothes I loved wearing and what items I felt most happy in. I whittled my wardrobe down some more by getting rid of things that I never reached for. My very own style began to emerge in the remaining set of clothes. This simple act of cleaning out my wardrobe and having clothes I loved within easy reach, had an immediate good effect on my mornings. 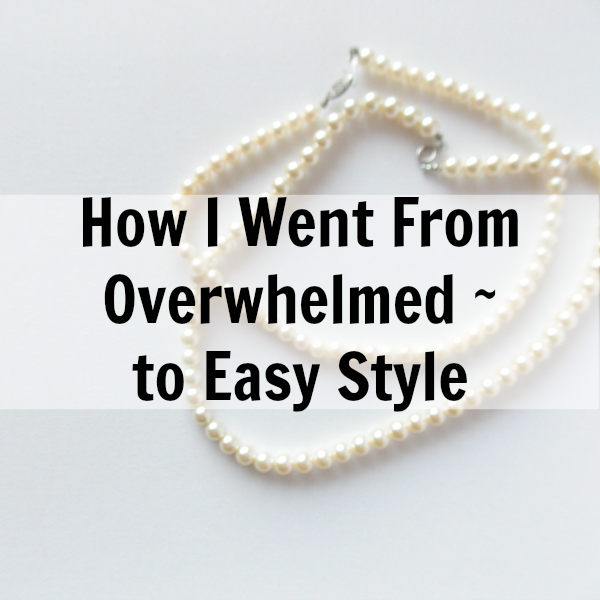 I was able to quickly pull out an outfit I felt good in, and be ready in minutes. I felt prepared for the day and that influenced the way I felt about myself and how I dealt with the kids. Because I was caring for myself, I found myself caring better for them. I could make a quick run to the store without having to "clean myself up". Someone could stop by and I didn't feel embarrassed to be seen. The more I learned about capsule wardrobes and how many outfits I could make with a small set, the more energized and excited I became. The more clothes I let go of, the happier I felt. If the house was a wreck, I could open my closet and see all the beautiful spaciousness there. The reason I share about creating a capsule wardrobe, is because I know there are women like me, who are overwhelmed. You are so busy with all you do, that style seems like a luxury you don't have time for. My heart goes out to you because feeling good about your appearance doesn't have to take a lot of time and it doesn't have to be hard. You don't have to be high fashion to look nice and feel human again. My goal is to make it easy for you to have something to wear that feels authentically you and doesn't take away from all you're needing to do in a day. If you struggle with your wardrobe, please leave me a comment. I'd really like to encourage you! You can also scroll through my tips to help create a simple wardrobe you'll enjoy. Thanks to you, I am finally beginning to understand how to dress and how to shop! You inspired me to capsulize my wardrobe, and now I always have something to wear (as long as I've done laundry, haha). Recently I've begun to do school visits, so I needed to get some clothes that would be appropriate for that, and comfortable, and would go with the favorites that I had picked out of my own closet based on your advice. I knew that school temperatures are very unpredictable, so I needed removable layers. I actually had a nice time shopping for myself for once, because I had you in my brain guiding me along! So thank you. You rock! I feel a little ridiculous being so happy about this. Haha. Rebecca, I am so excited for you!! I have felt that same way "should I be THIS excited about this?" But I think what feels so empowering is the freedom from all the excess and discovering what we love! It takes the guesswork out of shopping and dressing! I LOVE hearing your journey!! And that wearing the 99 cent jacket makes you "look like you're from New York" (so sweet)! SO sorry, I just saw this! If you are still needing this, let me know!